It’s official: Spring has begun! Which means it’s time to kick off the spring nature photo scavenger hunt. Here’s how it works: I’ve come up with 30 things you and your kiddos can “hunt for” outside this spring. Find an item, snap a picture and check the item off your list. Will you be able to find everything before summer gets here? You don’t need to sign up to play. 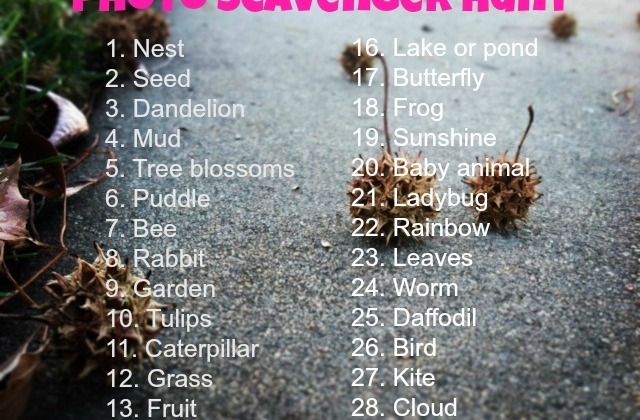 To get started, print out your free Spring Nature Photo Scavenger Hunt list. Post it somewhere you’ll see it every day. Then head outside and into nature with your family and start exploring! Share your photo on the Go Explore Nature Facebook page. Use the hashtag #springnaturehunt to share photos on Instagram and Twitter. If you’re on Pinterest, leave your username in the comments below & follow any of my boards. 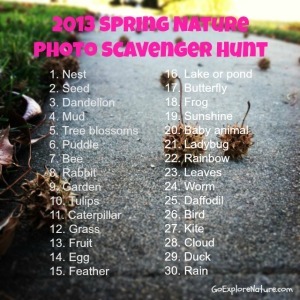 I can then invite you to add your photos to the Spring Nature Photo Scavenger Hunt board. And if you’d love to play along but have no desire to share your photos publicly, please do so! At the end of the season, you’ll have a wonderful collection of memories perfect for a photo book. This scavenger hunt is meant to be fun, so don’t worry if you miss an item or don’t start playing along until mid-season. The point of all of this is to get outside with your family and connect with nature. Love this….just added to my blog. Thanks! Great to have you joining us, Sere. Your photos are always so beautiful! Look for your Pinterest invite shortly. Love the idea but the weather isn&#39;t cooperating for most of the list quite yet – does a frozen lake count? We&#39;ll definitely be participating once spring arrives to Calgary. Yay! Your invite should be on its way, Alexandra! I&#39;m thrilled you&#39;re going to join us again, Dawn! Got it, Sylvia. Your invitation is on it&#39;s way. this is a fab idea. my oldest is only 3 but i&#39;d love to join!! I&#39;d love to participate again! !<br />Pinterest: Alex Dk<br /><br />Thanks! I&#39;m loving reading all of your posts! Such great ideas–I find myself getting lost in all of the links at the end of each of your posts 🙂 Do you know the name of the flower? I remember having some of those at my house when I was little, and I always thought they were such interesting and pretty flowers! Right back at ya, Ali. Have fun! Awww … thanks, Regina! Happy spring! Thank you!! This is going to be so much fun!! Happy First Day of Spring!! What a fantastic resource, Kim! Thank you so much for sharing. You can use the hashtag #springnaturehunt. Glad to have you join the fun, Penny! Great, Alicia, just added you to the Pinterest board. Look for your invitation shortly. Soooo love this idea Debi! Having a super busy fortnight this week but I&#39;ll try and start on Sunday when it become slightly less hectic. Do you have a hashtag for this, I&#39;m thinking of instagraming them!